Julie Ferwerda's website | Morty Still Stinks! 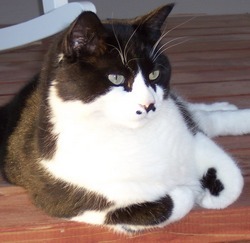 It's been more almost five months since that fateful day in February (see "Pepe Le Pew Got Skunked" Journal entry for Feb. 14) when my cats both got into a Valentine's week love-fest with a skunk. This was the night before I was leaving town on a business trip, no less, and I had to leave the wet, shivering cats out in the winter cold while I was gone. Well, I did use the blow dryer on them first. But that didn't fully do the trick. I have never seen a sorrier cat than Morty that night, who had a direct hit to the face. I don't know if you've ever smelled skunk up close, but it's a cross between burning rubber and horrendously hot onions. All our eyes were burning, and Morty seemed to have trouble breathing. We gave him two tomato juice baths that night, as well as a fresh water bath with shampoo. But no matter how much we lathered and scrubbed, he was still yellow and stinky. Ever since then (5 months and counting), I've bathed Morty's face and neck many times with all kinds of concoctions, trying to get the au de skunk parfum out for good. To no avail. It's still there, and it's still slightly more than faint, even after this long. In other words, Morty still stinks! All this is to say, I think the effects of sinful choices are a lot like that skunk incident. I mean, you make a big mistake and you come home all stinky, wondering what just hit you. God dunks you in a red bath of His Son's blood and cleans you up. Luckily, He's never going out of town so you don't get stuck outside in the cold garage. He always brings you back in His house where you are safe and warm, away from the skunks of life. As far as God is concerned, your life is restored like new after you confess and turn away from your sin, but there is always this lingering scent of consequences that takes awhile to go away. Depending on how much of a direct hit, it could take awhile until it's all gone. Thankfully, Pepe and Morty seemed to have learned a valuable lesson about skunks and we haven't had any more incidents. But the other night, Morty did find another new friend that he brought up on our deck in the middle of the night. It was a huge raccoon! Instead of a bright yellow smile, all Morty had to show for his newfound love affair was a little scratch on his nose. I guess we'll have to see if he learned anything from that encounter. In the mean time, he still stinks, but he's getting better every month! 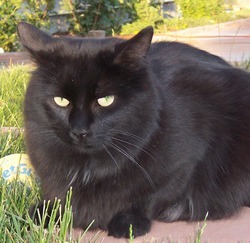 Posted in categories: Julie's Wacky Family & Pets | Who Knew? The formal article encouraged me very much! Bookmarked the website, very great categories everywhere that I read here! I really like the information, thanks. Fantastic article, thanks for sharing the info. It isn’t too often that you study articles in which the poster knows what they are blogging about. Sentence structure as well as punctuational tend to be spot on too, just trouble We appeared to have had been mentioning the site, appeared slow. Appears like additional visitors experienced exactly the same trouble?